For sale is an 8x10 photograph signed by Andrew Luck in permanent sharpie. 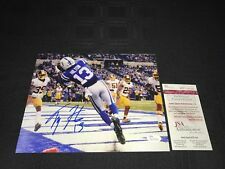 TY HILTON COLTS SIGNED 8X10 PHOTO. JSA WITNESSED COA. Photo is signed in SILVER sharpie! TY HILTON COLTS SIGNED 8X10 PHOTO. JSA WITNESSED COA. Photo is signed in BLUE sharpie! Original hand signed by Ty Hilton. It's not a copy or reprint. A Perfect item for any collection. It is double matted in blue and white with Ty Hilton cut into the mat as well as two 4x6 photos. Another great item brought to you by All About Sports Plus Framing. 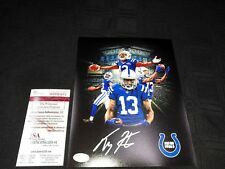 TY HILTON INDIANAPOLIS COLTS SIGNED 8X10 PHOTO JSA WIT COA WP114195 FREE S&H! You will receive the exact item pictured. The 4x6 photo of the celebrity signing (if pictured) is included FREE with the item. PEYTON MANNING (Indianapolis Colts). Signed in blue sharpie. This is a hand signed Darius Leonard 8x10 photo. This was signed by the colts star during super bowl week. He is without a doubt the future of the nfl on the defensive side of the ball. He lead the nfl in tackles as a rookie and had of great season that is his first of what will be many great years in the league. He won defensive rookie of the year in 2018. He is gonna be a super star. This is a great photo and an absolute must have for any fan or collection. This photo comes with a coa from psa/dna and shipping is 5.00. Any questions please ask. Pat McAfee signed 8x10 photo. Item was hand signed by former Indianapolis Colts Punter, Pat McAfee in person and guaranteed to be authentic. Photo is in excellent condition. Buyer agrees to pay $4.00 first class shipping. U.S. bidders only. 8x10 Photograph - personalized to John. All high quality images in excellent condition unless otherwise noted. TY HILTON INDIANAPOLIS COLTS SIGNED 8X10 PHOTO JSA WIT COA WP114175 FREE S&H! This is an officially licensed 8x10 photo that has been personally autographed by Marshall Faulk. This includes a certificate of authenticity from Denver Autographs and James Spence Authentication (JSA). You are buying a photo signed by Andrew Luck. It is in perfect condition. It is accompanied by a coa from Psa/Dna. Thank you! TY HILTON COLTS SIGNED 8X10 PHOTO. JSA WITNESSED COA. Photo is signed in BLACK sharpie! Original hand signed by Ty Hilton. It's not a copy or reprint. A Perfect item for any collection. It is double matted in blue and white with Hilton cut into the mat as well as a 16x20 photo. Another great item brought to you by All About Sports Plus Framing. T.Y. TY Hilton Hot! Each signature submitted for autograph authentication is thoroughly examined by the foremost sports signature expert in the industry. TY HILTON INDIANAPOLIS COLTS SIGNED 8X10 PHOTO JSA WIT COA WP114101 FREE S&H! REGGIE WAYNE . SIGNED BY:REGGIE WAYNE. "INDIANAPOLIS COLTS" 8X10 PHOTO. Pics of REGGIE WAYNE signing Autographs are NOT included with Item . COA: from THEFRIENDLYSTRANGER. SUPER BOWL XLI CHAMPION!! PEYTON MANNING SIGNED AUTO 5X7 PHOTOGRAPH PHOTO COLTS FROM HIS FOUNDATION. "INDIANAPOLIS COLTS" 8X10 PHOTO. ANDREW LUCK . SIGNED BY:ANDREW LUCK. Pics of ANDREW LUCK signing Autographs are NOT included with Item . COA: from THEFRIENDLYSTRANGER. ITEM : 8X10 PHOTO. (THE PHOTO WAS PRINTED IN A PHOTO LAB ON PHOTO PAPER, NOT A CHEAP COMPUTOR PRINTOUT. 1) VALUE OF THE AUTOGRAPH. 2) COST OF THE ITEM. 3) COST OF THE AUTHENTICATION. I DO NOT DO HALF PRICE SALES. CRYSTAL CLEAR COLOR 8X10 PHOTO HAND SIGNED BY THE STAR LISTED IN THE ITEM TITLE. This is a 8x10 Photo personally autographed by Bill Polian with HOFinscription.This includes a certificate of authenticity from James Spence Authentication (JSA) and Denver Autographs. This item is a signed John Mackey Baltimore Colts 16x20 Photo. This is the actual photo you will receive. Please see scan for condition. Certificate of authenticity is issued by James Spence Authentication (JSA) K45237.